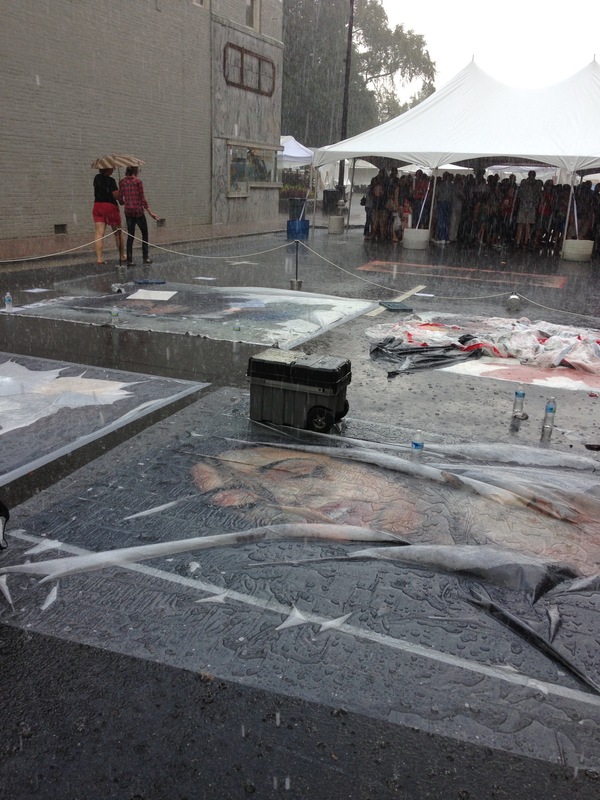 Wind and rain are the worry of any street artist working in a non-permanent medium like chalk. However, artists who are prepared for inclement weather will experience delay rather than defeat when finishing their project. Rain tends to be an issue while you’re actively working on your project while wind is something that will more often affect projects that stretch over several days. When leaving a piece exposed overnight, wind will stip away the crisp colors from your piece.When the chalk dust migrates across your piece, lines and colors will become muddied leading to a less eye popping finished product. An effective way to protect your project is with duct tape and plastic drop cloth. 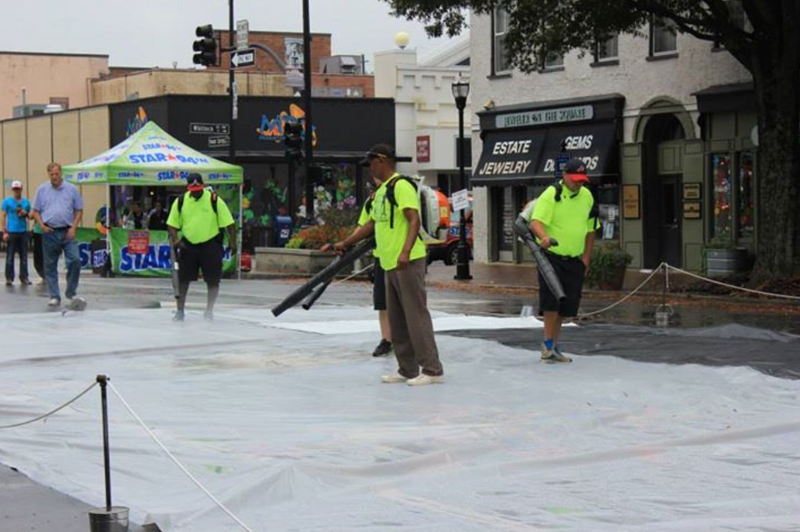 Some festivals have large tarps to provide coverage for all the artists at one time, while other festivals and personal projects will require materials provided by the artist. Duct tape will adhere well to asphalt and concrete so long as it isn’t wet or covered with any particulate such as leaves or sand. Make sure to sweep away anything that will sit between your tape and the surface you’re taping so that water cannot work its way in between the tarp and the drawing. The great thing about plastic drop cloth is that is comes in so many sizes and thicknesses and is relatively cheap. 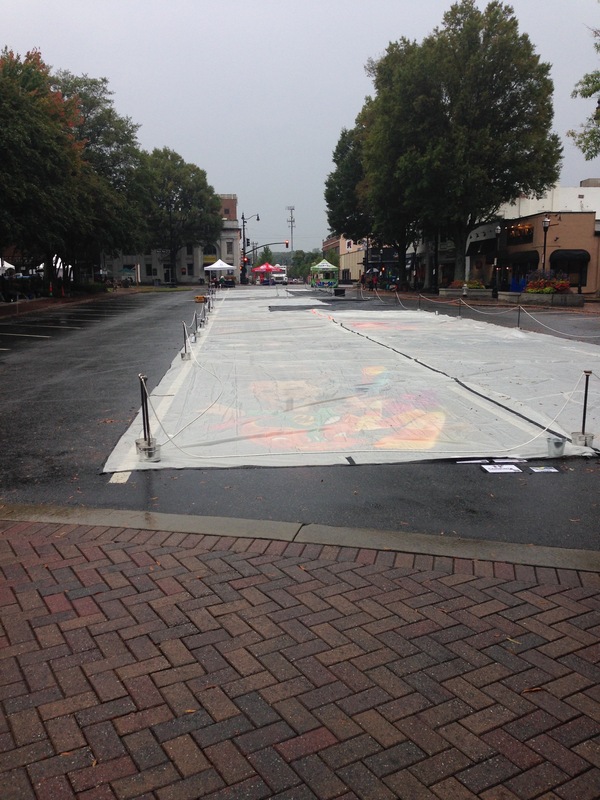 The tarp when secured with duct tape will provide enough protection to prevent loss of progress in rain so long as there isn’t a total washout. 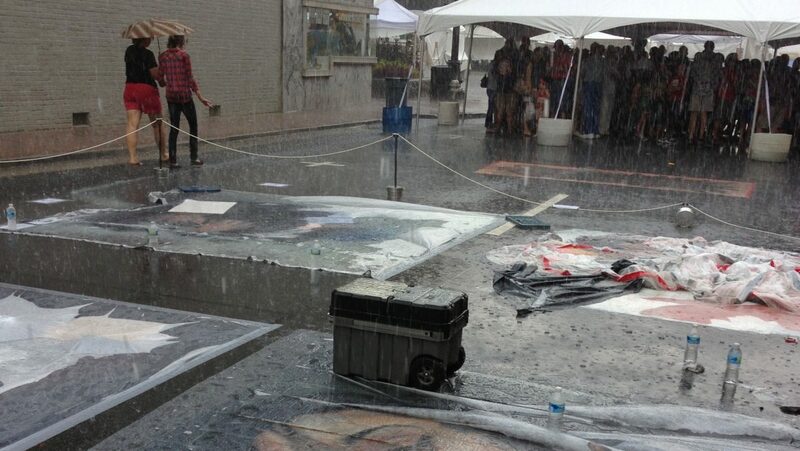 Don’t be afraid to put your piece under cover at the first drop of rain. Remember, it’s not all or nothing; you can half cover your piece if inclement weather is imminent, ready to fully cover when fat drops start falling. After the rain passes you’ll need a plan for removing your tarp without creating a river that will affect your own work and the work of others. In more organized environments you may have access to blowers; this provides a low impact method of removing water quickly. If a leaf blower is not available, simply throw the used drop cloth away. Don’t reuse it since that risks getting water from the tarp on your piece. Pop-up tents can be great for use on a project to shield from the sun, but they’re not well suited for use in heavy rain. Water doesnt’ have to fall directly on your piece to ruin it. 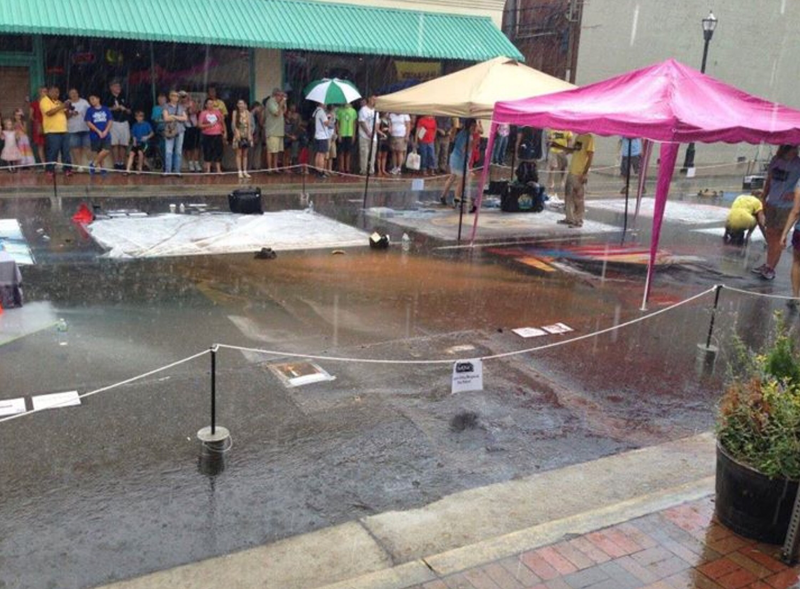 Runoff won’t respect your neighboring artist and will cause more harm than good. It’s up to you whether or not a tent fits your need. Creating art installations in chalk is challenging and rewarding. Rain is part of the job description and makes the experience special since it’s an ephemeral work of art shared within a window of time. It is the art of now. 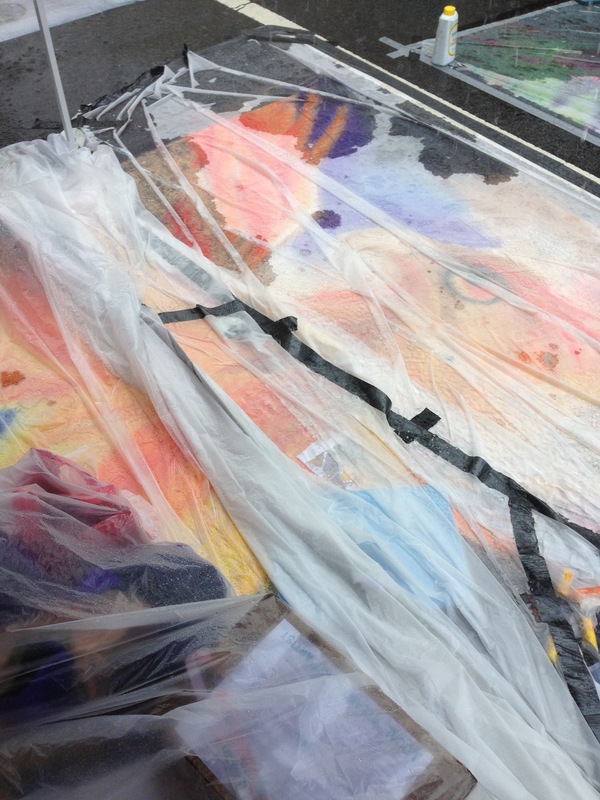 Preparation for rain will make sure that the window is longer than nature has planned for you and will allow you to continue working on your piece should the weather not cooperate.